Here is best"Trinbago Knight Riders vs St Lucia match" Caribbean Premier League 2018, DREAM11 Predictions for the Fantasy user ,who venue are looking to make a strong team for maximum win. We are providing latest news, match update, information about the match .The team is picked by using various factors on the basis of performance, ground stats and latest form. 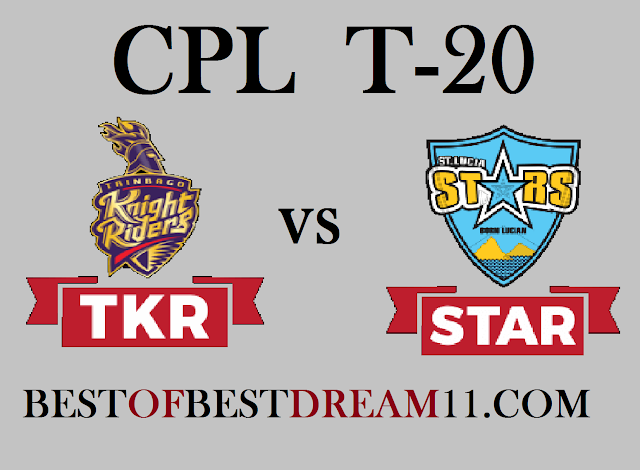 In the ninth match of Caribbean Premier League,when teams of TKR and STAR face face-to-face ,both teams will try to return to winning track in this series with victory. TKR's team has played three matches so far,out of which only one has won. On the other hand, the condition of the star's team is quite bad; he has played three matches so far and all three have had to face ddefeat. For TKR, Colin Munro is the most successful batsman in this tournament so far ,he has scored 164 runs in the last three matches. C lynn, B Macculum and Darren Bravo also contributed well in all the three matches played so far. in bowling, Ali Khan(7wkt) and F Ahmed have had fantastic bowling till now. Sunil narine and DJ Bravo will have to take responsibility. For STARS, A Fletcher and L Simmon have done some good thing till now. captain Kiron Pollard has performed a good all rounder performance. in bowling, Q Ahmed took 3 wickets in the last matches,while Mitchell Mcclenaghan and K Williams will have to bowl well.